Here's some good news. 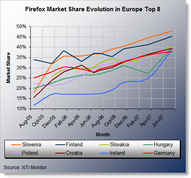 Firefox market share in Europe is almost 28% according to XitiMonitor. In Germany it's 38%, and several other countries have higher usage. Opera is at 3.5% and Safara is at 1.7% in Europe. I'd be more pleased if it was a quarter each by three different browsers, with half a dozen others taking the other quarter, but this is much better diversity than 98% IE. A rising tide lifts all boats... or something like that. I think that Mozilla has done quite a bit to revitalize competition in the browser space. Mozilla showed that browsers weren't "done" as MS thought in 2001 when they disolved their IE team. Now we have a pretty nice landscape with IE, Firefox (and other Gecko-based browsers,) Safari (and other webkit-based browsers,) and Opera.